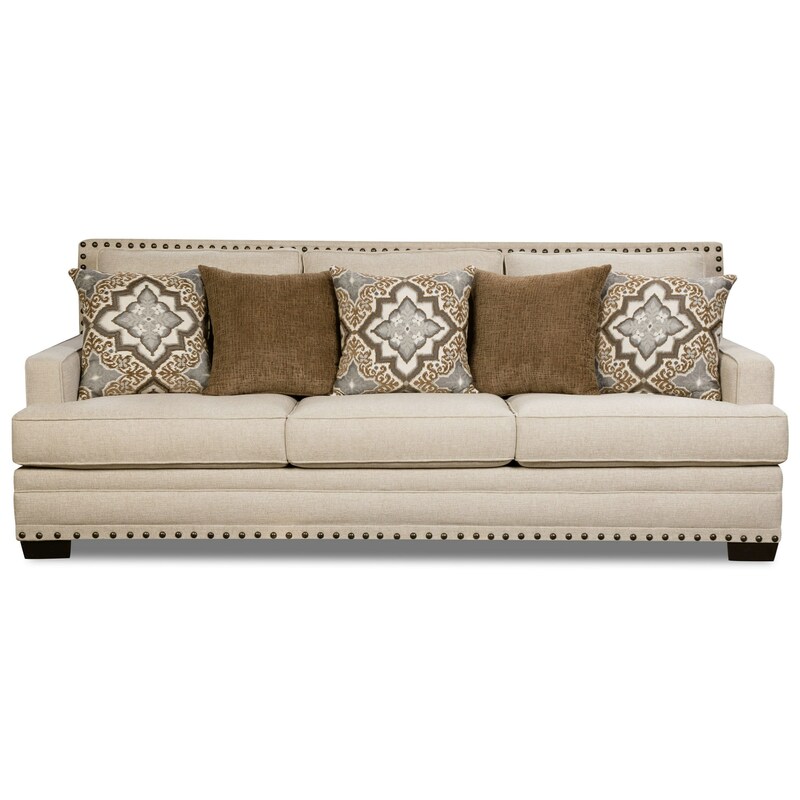 The perfect blend of contemporary and traditional, this sofa will look great alongside a variety of living room decor. Track arms contribute to the more modern appearance of this piece, while nailhead trim detailing around the entirety of this sofa gives it its timeless appeal. Included accent pillows and plush cushions offer additional levels of comfort and design to this staple piece. The 34B0 Transitional Sofa with Nailhead Trim by Corinthian at Miskelly Furniture in the Jackson, Pearl, Madison, Ridgeland, Flowood Mississippi area. Product availability may vary. Contact us for the most current availability on this product. Padding & Ergonomics 1.8 density, 28-30lb PSI compression seat cushions. Poly dacron filled back cushions. Elevate the style of your living room with this collection of transitional pieces. With design styles such as track arms and high backs, along with nailhead trim detailing, this collection is made to impress. The 34B0 collection is a great option if you are looking for Transitional furniture in the Jackson, Pearl, Madison, Ridgeland, Flowood Mississippi area. Browse other items in the 34B0 collection from Miskelly Furniture in the Jackson, Pearl, Madison, Ridgeland, Flowood Mississippi area.